The first comprehensive synthesis on the effects of climate change on the world’s oceans has found they are now changing at a rate not seen for several million years. In an article published June 18 in Science magazine, scientists reveal the growing atmospheric concentrations of man-made greenhouse gases are driving irreversible and dramatic changes to the way the ocean functions, with potentially dire impacts for hundreds of millions of people across the planet. The findings of the report emerged from a synthesis of recent research on the world’s oceans, carried out by two of the world’s leading marine scientists, one from The University of Queensland in Australia, and one from The University of North Carolina at Chapel Hill, in the USA. He said that the Earth’s ocean, which produces half of the oxygen we breathe and absorbs 30% of human-generated CO2, is equivalent to its heart and lungs. “Quite plainly, the Earth cannot do without its ocean. This study, however, shows worrying signs of ill health. Report co-author, Dr John F. Bruno, an Associate Professor at The University of North Carolina, says greenhouse gas emissions are modifying many physical and geochemical aspects of the planet’s oceans, in ways “unprecedented in nearly a million years.” “This is causing fundamental and comprehensive changes to the way marine ecosystems function,” Dr Bruno said. According to leading US marine scientist, the University of Maine’s School of Marine Services Professor Robert S. Steneck, the study provides a valuable indicator of the ecological risk posed by climate change, particularly to coastal regions. “While past studies have largely focused on single global threats such as ‘global warming’, Hoegh-Guldberg and Bruno make a compelling case for the cumulative impacts of multiple planet-scale threats,” Prof. Steneck said. EnviroMission Ltd. recently filed two land applications in the United States for two prospective Solar Tower power station developments. Melbourne, Australia-based EnviroMission Limited, also opened operations in Phoenix, Arizona, and established a 100% owned subsidiary, EnviroMission (USA) Inc., to lead Solar Tower development in the American market. The drive for Solar Tower development in America is based on the availability and acquisition of suitable land. Each Arizona land application for 5,500 acres meets the site development requirements for a single 200MW Solar Tower power station. The Arizona State land sites were identified as ideal for Solar Tower development within due diligence studies that showed critical development criteria, including meteorological and solar insulation parameters met and exceeded at each site. Ownership surveys, completed in May 2009, informed both applications and identification of the sites will remain confidential until the application process requires further disclosure in order to avoid any prejudice to EnviroMission’s applications. Cultural, archeological and environmental surveys are expected to be completed in July 2009. 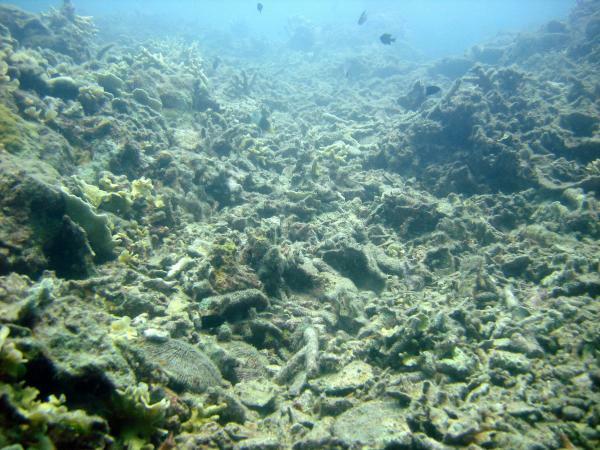 Oceans cover more than 70% of the Earth’s surface. As the world’s largest solar collectors, oceans generate thermal energy from the sun. They also produce mechanical energy from the tides and waves. Even though the sun affects all ocean activity, the gravitational pull of the moon primarily drives the tides, and the wind powers the ocean waves. Wave energy is the capture of the power from waves on the surface of the ocean. It is one of the newer forms of renewable or ‘green’ energy under development, not as advanced as solar energy, fuel cells, wind energy, ethanol, geothermal companies, and flywheels. However, interest in wave energy is increasing and may be the wave of the future in coastal areas according to many sources including the International Energy Agency Implementing Agreement on Ocean Energy Systems (Report 2009). Although fewer than 12 MW of ocean power capacity has been installed to date worldwide, we find a significant increase of investments reaching over $2 billion for R&D worldwide within the ocean power market including the development of commercial ocean wave power combination wind farms within the next three years. Tidal turbines are a new technology that can be used in many tidal areas. 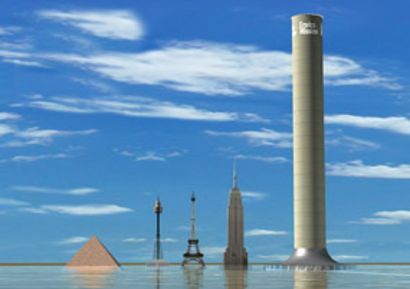 They are basically wind turbines that can be located anywhere there is strong tidal flow. Because water is about 800 times denser than air, tidal turbines will have to be much sturdier than wind turbines. They will be heavier and more expensive to build but will be able to capture more energy. For example, in the U.S. Pacific Northwest region alone, it’s feasible that wave energy could produce 40–70 kilowatts (kW) per meter (3.3 feet) of western coastline. Renewable energy analysts believe there is enough energy in the ocean waves to provide up to 2 terawatts of electricity. Siemens AG (SI) is a joint venture partner of Voith Siemens Hydro Power Generation, a leader in advanced hydro power technology and services, which owns Wavegen, Scotland’s first wave power company. Wavegen’s device is known as an oscillating water column, which is normally sited at the shoreline rather than in open water. A small facility is already connected to the Scottish power grid, and the company is working on another project in Northern Spain. Ocean Power Technologies, Inc (OPTT) develops proprietary systems that generate electricity through ocean waves. Its PowerBuoy system is used to supply electricity to local and regional electric power grids. Iberdrola hired the company to build and operate a small wave power station off Santona, Spain, and is talking with French oil major Total (TOT) about another wave energy project off the French coast. It is also working on projects in England, Scotland, Hawaii, and Oregon. Pelamis Wave Power, formerly known as Ocean Power Delivery, is a privately held company which has several owners including various venture capital funds, General Electric Energy (GE) and Norsk Hydro ADR (NHYDY.PK). Pelamis Wave Power is an excellent example of Scottish success in developing groundbreaking technology which may put Scotland at the forefront of Europe’s renewable revolution and create over 18,000 green high wage jobs in Scotland over the next decade. The Pelamis project is also being studied by Chevron (CVX). Endesa SA ADS (ELEYY.PK) is a Spanish electric utility which is developing, in partnership with Pelamis, the world’s first full scale commercial wave power farm off Aguçadoura, Portugal which powers over 15,000 homes. A second phase of the project is now planned to increase the installed capacity from 2.25MW to 21MW using a further 25 Pelamis machines. RWE AG ADR (RWEOY.PK) is a German management holding company with six divisions involved in power and energy. It is developing wave power stations in Siadar Bay on the Isle of Lewis off the coast of Scotland. Australia’s Oceanlinx offers an oscillating wave column design and counts Germany’s largest power generator RWE as an investor. It has multiple projects in Australia and the U.S., as well as South Africa, Mexico, and Britain. Alstom (AOMFF.PK) has also announced development in the promising but challenging field of capturing energy from waves and tides adding to the further interest from major renewable power developers in this emerging industry. Electric Power Research Institute, Inc (EPRI) (Palo Alto, Calif.) Fish-friendly hydropower turbine development & deployment. EPRI will address the additional developmental engineering required to prepare a more efficient and environmentally friendly hydropower turbine for the commercial market and allow it to compete with traditional designs. Verdant Power Inc. (New York, N.Y.) Improved structure and fabrication of large, high-power kinetic hydropower systems rotors. Verdant will design, analyze, develop for manufacture, fabricate and thoroughly test an improved turbine blade design structure to allow for larger, higher-power and more cost-effective tidal power turbines. Public Utility District #1 of Snohomish County (SnoPUD) (Everett, Wash.) Puget Sound Tidal Energy In-Water Testing and Development Project. SnoPUD will conduct in-water testing and demonstration of tidal flow technology as a first step toward potential construction of a commercial-scale power plant. The specific goal of this proposal is to complete engineering design and obtain construction approvals for a Puget Sound tidal pilot demonstration plant in the Admiralty Inlet region of the Sound. Pacific Gas and Electric Company – San Francisco, Calif. WaveConnect Wave Energy In-Water Testing and Development Project. PG&E will complete engineering design, conduct baseline environmental studies, and submit all license construction and operation applications required for a wave energy demonstration plant for the Humboldt WaveConnect site in Northern California. Concepts ETI, Inc (White River Junction, Vt.) Development and Demonstration of an Ocean Wave Converter (OWC) Power System. Concepts ETI will prepare detailed design, manufacturing and installation drawings of an OWC. They will then manufacture and install the system in Maui, Hawaii. Lockheed Martin Corporation (LMT) – Manassas, Va., Advanced Composite Ocean Thermal Energy Conversion – “OTEC”, cold water pipe project. Lockheed Martin will validate manufacturing techniques for coldwater pipes critical to OTEC in order to help create a more cost-effective OTEC system. Electric Power Research Institute (Palo Alto, Calif.) Wave Energy Resource Assessment and GIS Database for the U.S. EPRI will determine the naturally available resource base and the maximum practicable extractable wave energy resource in the U.S., as well as the annual electrical energy which could be produced by typical wave energy conversion devices from that resource. Georgia Tech Research Corporation (Atlanta, Ga.) Assessment of Energy Production Potential from Tidal Streams in the U.S. Georgia Tech will utilize an advanced ocean circulation numerical model to predict tidal currents and compute both available and effective power densities for distribution to potential project developers and the general public. Re Vision Consulting, LLC (Sacramento, Calif.) Best Siting Practices for Marine and Hydrokinetic Technologies With Respect to Environmental and Navigational Impacts. Re Vision will establish baseline, technology-based scenarios to identify potential concerns in the siting of marine and hydrokinetic energy devices, and to provide information and data to industry and regulators. Pacific Energy Ventures, LLC (Portland, Ore.) Siting Protocol for Marine and Hydrokinetic Energy Projects. Pacific Energy Ventures will bring together a multi-disciplinary team in an iterative and collaborative process to develop, review, and recommend how emerging hydrokinetic technologies can be sited to minimize environmental impacts. PCCI, Inc. (Alexandria, Va.) Marine and Hydrokinetic Renewable Energy Technologies: Identification of Potential Navigational Impacts and Mitigation Measures. PCCI will provide improved guidance to help developers understand how marine and hydrokinetic devices can be sited to minimize navigational impact and to expedite the U.S. Coast Guard review process. Science Applications International Corporation (SAI) – San Diego, Calif., International Standards Development for Marine and Hydrokinetic Renewable Energy. SAIC will assist in the development of relevant marine and hydrokinetic energy industry standards, provide consistency and predictability to their development, and increase U.S. industry’s collaboration and representation in the development process. Oregon State University, and University of Washington – Northwest National Marine Renewable Energy Center. OSU and UW will partner to develop the Northwest National Marine Renewable Energy Center with a full range of capabilities to support wave and tidal energy development for the U.S. Center activities are structured to: facilitate device commercialization, inform regulatory and policy decisions, and close key gaps in understanding. University of Hawaii (Honolulu, Hawaii) National Renewable Marine Energy Center in Hawaii will facilitate the development and implementation of commercial wave energy systems and to assist the private sector in moving ocean thermal energy conversion systems beyond proof-of-concept to pre-commercialization, long-term testing. There are two main types of hydro turbines: impulse and reaction. The type of hydropower turbine selected for a project is based on the height of standing water— the flow, or volume of water, at the site. Other deciding factors include how deep the turbine must be set, efficiency, and cost. The impulse turbine generally uses the velocity of the water to move the runner and discharges to atmospheric pressure. The water stream hits each bucket on the runner. There is no suction on the down side of the turbine, and the water flows out the bottom of the turbine housing after hitting the runner. An impulse turbine, for example Pelton or Cross-Flow is generally suitable for high head, low flow applications. A reaction turbine develops power from the combined action of pressure and moving water. The runner is placed directly in the water stream flowing over the blades rather than striking each individually. Reaction turbines include the Propeller, Bulb, Straflo, Tube, Kaplan, Francis or Kenetic are generally used for sites with lower head and higher flows than compared with the impulse turbines. There are three types of hydropower facilities: impoundment, diversion, and pumped storage. Some hydropower plants use dams and some do not. Many dams were built for other purposes and hydropower was added later. In the United States, there are about 80,000 dams of which only 2,400 produce power. The other dams are for recreation, stock/farm ponds, flood control, water supply, and irrigation. Hydropower plants range in size from small systems for a home or village to large projects producing electricity for utilities. The most common type of hydroelectric power plant (above image) is an impoundment facility. An impoundment facility, typically a large hydropower system, uses a dam to store river water in a reservoir. Water released from the reservoir flows through a turbine, spinning it, which in turn activates a generator to produce electricity. The water may be released either to meet changing electricity needs or to maintain a constant reservoir level. Wave energy rich areas of the world include the western coasts of Scotland, northern Canada, southern Africa, Japan, Australia, and the northeastern and northwestern coasts of the United States. In the Pacific Northwest alone, it’s feasible that wave energy could produce 40–70 kilowatts (kW) per meter (3.3 feet) of western coastline. The West Coast of the United States is more than a 1,000 miles long. In general, careful site selection is the key to keeping the environmental impacts of wave energy systems to a minimum. Wave energy system planners can choose sites that preserve scenic shorefronts. They also can avoid areas where wave energy systems can significantly alter flow patterns of sediment on the ocean floor. Economically, wave energy systems are just beginning to compete with traditional power sources. However, the costs to produce wave energy are quickly coming down. 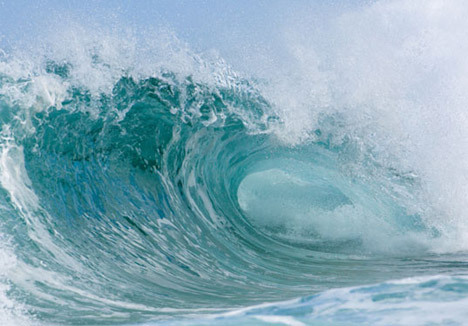 Some European experts predict that wave power devices will soon find lucrative niche markets. Once built, they have low operation and maintenance costs because the fuel they use — seawater — is FREE. The current cost of wave energy vs. traditional electric power sources? It has been estimated that improving technology and economies of scale will allow wave generators to produce electricity at a cost comparable to wind-driven turbines, which produce energy at about 4.5 cents kWh. For now, the best wave generator technology in place in the United Kingdom is producing energy at an average projected/assessed cost of 6.7 cents kWh. In comparison, electricity generated by large scale coal burning power plants costs about 2.6 cents per kilowatt-hour. Combined-cycle natural gas turbine technology, the primary source of new electric power capacity is about 3 cents per kilowatt hour or higher. It is not unusual to average costs of 5 cents per kilowatt-hour and up for municipal utilities districts. Currently, the United States, Brazil, Europe, Scotland, Germany, Portugal, Canada and France all lead the developing wave energy industry that will return 30% growth or more for the next five years. AUSTRALIA: ABB has helped Oceanlinx to construct a 250kW Wave Energy Conversion unit – a full-scale prototype designed to extract energy from ocean waves and convert it to electricity or to convert ocean water to clean water. The Wave Energy Conversion unit was completed at the ABB Performance Service Centre located in Port Kembla, NSW, Australia. The unit can save thousands of tonnes of CO2 and SO2 emissions annually, says ABB. It is a full-scale prototype with a unique commercially-efficient system for extracting energy from ocean waves and converting it to electricity, or utilising that energy to produce clean, fresh water from brine. ABB was involved in fabrication modifications and installation of the Wave Energy Conversion unit hood and steel work – including stiffening sections of the structure and fabricating two watertight doors. Oceanlinx Limited is an international company working in wave energy conversion. It developed the proprietary technology for extracting energy from ocean waves and converting it into electricity, or utilising that energy to provide desalinated industrial or potable grade water from sea water. Oceanlinx has a power purchase agreement with Australian utility Integral Energy for the supply of electricity from the 250kW prototype unit. All work was finished on schedule in early February, enabling the unit to be floated out to its operational location off the breakwater north of Port Kembla harbour, NSW, Australia. “ABB were professional, safety conscious and flexible in meeting all our requirements and we have been delighted with the fabrication, modifications and installation work performed,” said Oceanlinx chief operating officer, Stuart Weylandsmith. 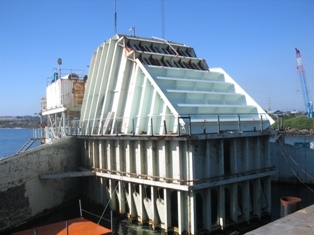 Oceanlinx’s core patented technology is an oscillating water column (OWC) device, based on the established science of wave energy, but one which, when compared to other OWC technologies offers major improvements in the design of the system, the turbine, and in construction technique, according to ABB. The technology has been successfully constructed and tested with the first full scale Oceanlinx wave plant, installed at Port Kembla producing zero CO2 and SO2 pollution.